Type: Education minister turned Colony President. 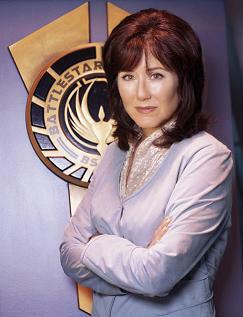 Education Minister Laura Roslin takes on a tremendous responsibility when the deadly Cylon attack leaves her next in line for the presidency. Toughly decisive when she needs to be, Laura is also a teacher with a strong intellect and moral backbone. Following a diagnosis for malignant breast cancer, she boarded a routine flight when the Cylons attacked and destroyed her home planet, leaving her president of the Twelve Colonies of Kobol. Intent on preserving a nucleus of humanity from the near-total destruction that has already killed billions, Laura returns to Battlestar Galactica and asserts her authority, ordering Adama (much against his will) to back down from battle, to abandon the fight with the Cylons, and to find a quiet corner of the universe for humanity to rebuild itself over the course of time.